What was the line in Fields of Dreams? "If you build it, they will come"? What is the relationship between intent and outcome? Does the Field of Dreams quote, “if you build it, they will come” have truth to it? Not exactly, but it does allude to an important and true concept (which is likely why we still quote, and mis-quote, it today). The truth is: If you build it, you increase the odds of them coming. In other words, if you put thought and energy you put into a project you increase the likelihood of success. An interesting framework into which a discussion of rail enhancement projects can be slotted. There have been re-opening failures - you may argue "special case" or "that wasn't fully built" or "they we're given long enough to come" in those cases, but a typical enhancement is so heavily studied, analysed, costed these days, with massive "optimism factors" built in to the equations - that it may feel like the misquoted "build it and they will come" when you look back at each story and how they tend to do very well. I was up in Swindon yesterday (picture clearly shows!) - with a whole lot of Community Rail representatives learning / being updated on the various changes underway. And indeed the changes are underway and actually happening. At platform 4, an IET was headed to Bristol and beyond - very recent. At platform 2 sat a 166 - that's 'new' this year. And the Westbury 2 coach train arrived at and left from platform 1 ... again 'new' this year. And during the day, talk had turned very much to capacities, loadings, etc. The Swindon - Westbury ("with some services extended to Salisbury and Southampton") service runs across fertile ground for building traffic - extraordinarily fertile, with intermediate locations and destinations all being already-flourisihing communities and mostly with their own extant connections already - but those connections each lacking a direction that needs infill. Just how flourishing those communities are, and how much those connections with the communities and weaving their way into the very fabric of the communities, was brought home in the evening when I was at a fund-raiser meal (at a Melksham restaurant) with the local retired greyhound group . From the far end of the table I heard a discussion - oft heard - about travel in the area, with someone talking of longer distance travel and driving up to Chippenham to catch the longer distance train, someone else surprising them with the news that Melksham has a station, and a third person chipping in that they use it quite a bit but for many local journeys it needs to be more frequent than every 2 hours. Build it properly, to an appropriate level, iron out any show-stopper glitches that prevent them coming, and in our neck of the woods they WILL come up to a certain level to the TransWilts train service. I could pretty confidently say that an hourly train each way all day and evening (midnight to 05:30 gap) would - by the end of the current decade - have each train as busy as each train was last year. I could pretty confidently say that improvement of station access (thoughout the day, in both directions, reliably connecting) for those without their own car and for whom walking / cycling to the station isn't an option would - over a couple of years ramp-up - give a big positive difference too. But you'll note that I've only gone so far with "build it and they will come". Run a service at 15 minute frequency and - until there's further development in the area - you'll find your trains are not as busy as the one pictured. And up the service to Mallaig, or Barton on Humber, or calling at Kirton Lindsey to hourly and I suspect they would take so many years to come that the service would have lost support and steam and gone away before they came. There ARE other "build it and they will come" opportunities out there. Now that extra turbos are out there with local capacity, I suspect that building a station at Aztec West for the work area there, and another for Westgate Distribution Park (where there is further development potential) and giving them a decent joined up service would boost the traffic on that line rather noticeably and surprisingly fast. ..............where is all the additional capacity coming from? I really wouldn't get too excited about some 30 year old Turbos. 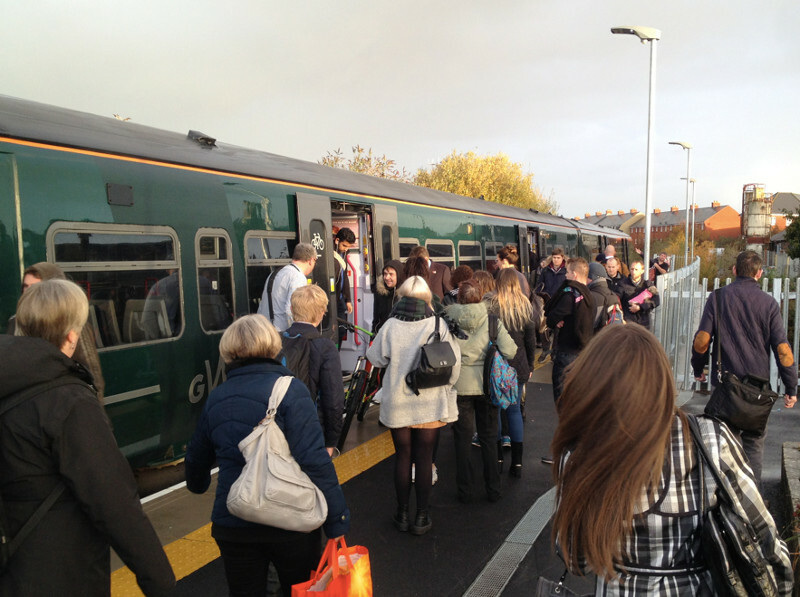 Right now GWR are unable to run a reliable service with reasonably tolerable levels of overcrowding on their most significant routes, from where are the resources for the upgrades you allude to going to come? You may not ... people who have had no train at all or who had to seriously move their work day to use the few available services may get excited. Good bucket list there - I'll give Penny a call and drop a hint. Slightly surprised to see quite so many on the lunch time train. I noted method of arrival at Melksham Station too ..
.. helps look at the critical onward journey issue. No surprise in these number. The service wasn't able to grow for the second half of last year (no more space on trains and extra carriage delayed , reliability issues too ) but I'm hoping to see an upturn again over coming months. The capacity issues are resolved (for the moment) and indeed the line is moving largely to turbos which are 3 cars as from Monday. Reliability has been much improved over the past month. So the grouding is there for to build. Question asked of me yesterday - "is it starting to grow again yet?". An interesting one, and not yet enough samples to know. Promotional work being done, market out there ... though January is always a quieter month. And an upturn is likely to be on a curve and not a sudden step change. Saw 15:18 returning off Swindon - and my goodness the 2 car 150/1 set looked busy! No counts as I was headed off to South Wales. 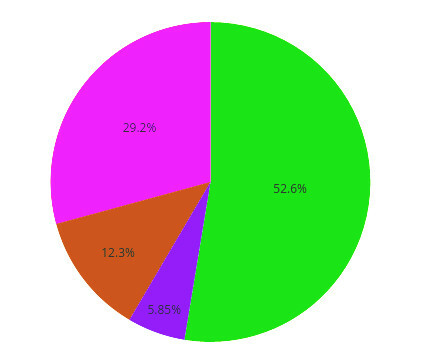 And comment from other (occasional, rail industry) user last week who travelled on 17:36 off Swindon - "what on earth was THAT like when it was one carriage "
Anyone like to guess what a pie chart might look like? Picking up an old thread ... sort of "Swan Song". 2018 has been a year of some disruption on the TransWilts ... with train counts being distorted by just about everything and anything that has been thrown at us - mostly (sad to say) railway related. But things are moving in the right direction; still the odd stumble (25 late, on time and 8 late first three trains this morning). Anyway ... longer trains, longer platform at Melksham ... and a count this morning had 12 getting off and 37 getting on to the 07:49 Swindon service, with 99 passengers on the train as it travelled up to Chippenham - so I make that 62 passengers from Trownridge or beyond to Chippenham and beyond. In old measure terms, 111/49 . And I'm noting that this is not the busiest train of the day - that's the southbound 17:36 off Swindon, which picks up the lion's share of returning commuters from both the 07:04 and 07:32 northbound from Westbury. Well - I think we're there. There's no definite cut off point and an eye always needs to be kept on things to ensure that greater forces and outside decisions don't have major adverse effects. I'm concerned at the draft timetables for (sometime in) 2019 for example, but in essence initial job done. The CRO job now moves on. Sophie has now been in the role of Community Rail Officer, and I have been feeding her updates (perhaps to excess), for a month. To service development, and to reaching those more difficult markets now that we have picked established a core pattern or ridership. I wish Sophie all the best, and my support where I can offer it and it's useful, in that work; maintaining the existing customer base with a more professional and less maverick approach than I have taken is also a natural progression. Homeward trip - after a forward looking meeting during the day (not in Wiltshire) - the 15:19 off Swindon. Pretty darned busy - lots of passengers off and more on at Chippenham - left with 63 passenger, of whom 17 got off at Melksham and a further 5 got on. That's 68/22 . And this service was the one that was the one that was the slowest builder from 2014. Vibrant now. Walked up into Melksham with one of our regular passengers. Nice. Walked up into Melksham with one of our regular passengers. For some reason that line reminded me of the scene in The Titfield Thunderbolt where the townsfolk walk down the hill to the train. When you think that these trains were a 153 (single carriage) last year, you begin to realise that the line is growing again and just how much "we" were being held back by the lack of capacity. Some, maybe ... but plenty going through to Swindon. 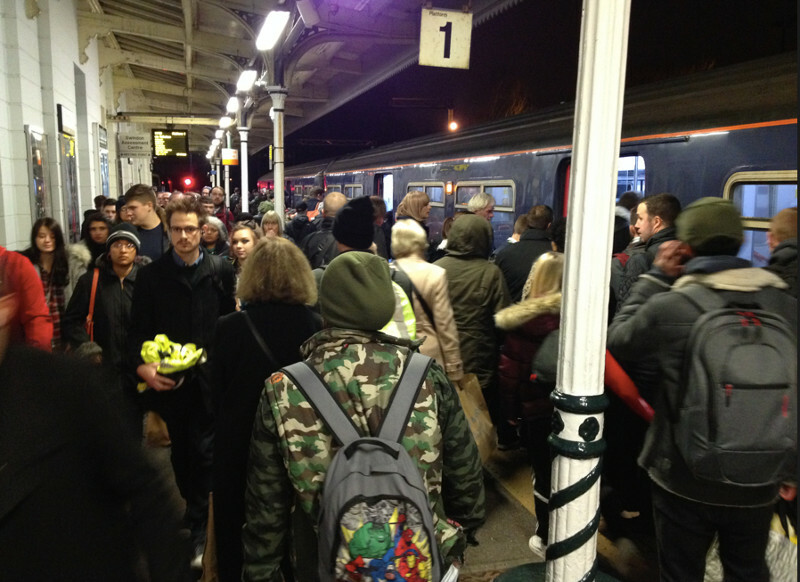 The Bath Christmas market did have a noticeable effect at Swindon where the Bath and Bristol train left full and heaving! Long station duties as people crammed on, and walked up and down the platform looking for a door they could squeeze into.